It’s been real quiet around here for the last week or two… thats because I’ve been hard at work on our long overdue Promo Video for our Pro Motion Menu Kit Products. Due to the extremely high demand for our Menu Kits, we decided to release them before we even had time to complete the promo. Well it’s now done after many long hours and we are ready to get back to designing some exciting new menus. Our next couple of kits should offer a little more variety, with designs perfect for Corporate, Theater Performances, Parties, and more! The promo looks even better while watching the High Quality Version. For those of you who are using After Effects in a different language besides English, you might have noticed many project files (such as the ones that come with our Pro Motion Menu Kits) have problems opening if it was originally created in another language version. This problem is caused by expressions that link to expression controls such as a “Slider”. I’m sure many of you have experienced skipping or freezing on your burned discs at one point or another. Some of you may have attributed it to a dirty disc, poor quality media, or maybe a burner that is going bad. Some of those issues may have been the culprit, however, the most common cause of this problem is caused by burning your disc at too fast of a speed. We’ve received many requests to have our product tutorials be available for download for various reasons. We liked this suggestion and decided to implement it. From the product tutorial page you are viewing, you can now simply click on the ‘Download’ button above the tutorial to save it to your computer. The download contains just the FLV video in zip format, and you can use Adobe Media Player to watch it. Our Adobe Encore tutorial that walks you through the process of authoring a Blu-ray or Standard DVD using custom motion menus has been updated! 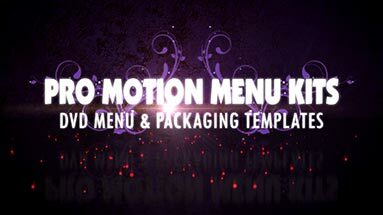 It can be accessed from either of our Pro Motion Menu Kit tutorial pages located in the Tutorial Section under Product Tutorials. The new tutorial incorporates the use of some features that make the authoring process much more streamlined, in addition to addressing many bugs and workarounds with the program.